 A message from Wine Library Bacio Divino Pazzo 2005 is an innovative red blend from Napa that earned a 91-point review from Robert Parker. Just $24.98 per bottle on sale at Wine Library today!  A Memorable Business Gift with The California Wine Club! Many professional and executive customers have told us that The California Wine Club is a memorable business gift for clients and colleagues.  Wine Advisor goes weekly For the time being, we'll publish once a week. I'm considering either Monday or Friday. If you'd like to express a preference, feel free to contact me by Email.  Wine Focus moves to Syrah For February, we're looking at Syrah-based wines from around the world. But first, one last Rioja tasting report. 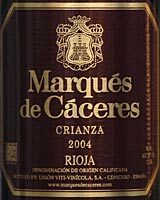  Marqués de Cáceres 2004 Rioja Crianza ($15.99) This modest, classically styled Rioja will cellar well but is mighty easy to drink right now. For February, we'll turn our online Wine Focus to Syrah-based wines from around the world. Syrah, the great grape of the Northern Rhone, has spread to many wine-growing regions beyond France. It's a major player in California, with Washington State becoming another strong contender on the U.S. West Coast; it's turning up in Spain and in some of the warmer parts of New Zealand, among others. And of course, usually labeled Shiraz, it's a mainstay grape of Australia. For this month we'll look primarily at the grape in its Syrah manifestation, although Australian readers who have little access to non-Shiraz Syrah are welcome to join in, preferably presenting notes on cool-climate Shiraz made in an elegant European style. 'll offer some Syrah tastings in a coming issue. For today, though, let's wrap up last month's wine focus with one more Rioja, a relatively modest but excellent bottle in the style called "Crianza." Based on the Spanish word for "nursing" or "bringing up," the word "Crianza" on the label denotes that the wine was aged for a specific term before it can be sold, and that at least some of that aging occured in oak casks. The time required in oak varies from region to region; in Rioja and its neighbor Ribera del Duero, the rule is 12 full months in oak. Crianzas are actually in the least-oaked category - you'll need to look for "Riserva" or "Gran Riserva" if you want still more! Today's featured wine, Marqués de Cáceres Rioja Crianza, is a blend of Tempranillo, Garnacha and Graciano grapes, aged in French and American oak casks. My tasting notes are below. One highly rated wine you may have missed: Bacio Divino Pazzo 2005, an innovative red blend from Napa that earned a 91 point review Robert Parker of The Wine Advocate. Fans of Orin Swift The Prisoner and other creative red blends will love this! Just $24.98 per bottle on sale at Wine Library, this fragrant, supple wine was one of our favorite Napa reds of 2008! Log on to place your order today... Click here for details! You may have seen us featured in GQ Magazine, The Wall Street Journal, New Jersey Monthly, and elsewhere. Wine Library features a huge collection of top wines from around the world, great gifts and accessories, a popular daily video blog (Wine Library TV), a wide selection of futures, and much, much more! Bottom line, we offer the lowest prices, the largest selection, lightning fast shipments and the greatest customer service in the industry! Winelibrary.com is your one-stop shop for everything wine... so what are you waiting for? Log on to winelibrary.com today! FOOD MATCH: Like virtually all dry reds, it's a great match with red meat; its relative elegance and grace pair it nicely, too, with lighter meats and poultry. It made a fine, if unexpected, winter-evening match with an old-fashioned chicken pot pie. VALUE: Excellent Rioja, no value issues at this mid-teens price. Still, Louisville prices continue to appear high for Rioja; look for it in the lower teens or even close to $10 in some markets. WHEN TO DRINK: Certainly delicious for current drinking, but typical of even the lower-end Riojas, it will surely reward careful cellar time.